I have to admit although I may not be loyal to many beauty products I have had a long term committed relationship with my Barry M nail varnishes. I have practically every colour they sell and for the past five years have not really branched out with my brands. However five years is a loooooooooooooooong time for nail varnish, and I went to paint my nails the other day to find most of my colours dry, difficult to manage and gloopy! Alas I thought this would be the perfect chance to indulge myself with some new colours! I love Revlon lipsticks, I may dare to say more than Mac! So I thought they would be the perfect place to start my new collection. There array of colours is beautiful, but the one which really caught my eye was Bewitiching. They Say: Revlon Nail Enamel gives up to 10 days of lasting colour and shine when worn with Revlon Base and Top Coat. Delivers gorgeously smooth, chip resistant colour to nails. Bewitching is a dark red, bordeaux colour. It is simply gorgeous and a perfect Autumn colour. I feel very grown up and classy when I wear it. It goes on opaque after one coat, so two or three coats are really needed to get the most out of the colour. I found the finish quite matte, you really do need a top coat to achieve that shiny finish. And far from Revlon's claim of 10 days as you can see my varnish has only lasted 4 days before the chips started to appear (and I am wearing a top and bottom coat). 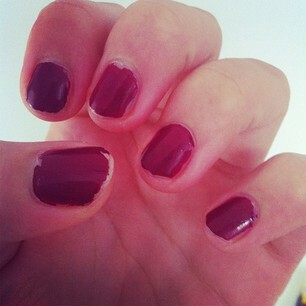 Nevertheless, whilst the nail varnish didn't last it promised time what nail varnishes out there really do! Unless you do nothing but twiddle your thumbs your nails are going to chip! I think the colour is something really speical, and for only £7.99 I will definitely be trying out other colours! Superdrug is having a 3 for 2 on all Revlon products at the moment and similarly Boots is running its 3 for 2 across various beauty buys! What do you think? Need it or Leave it?